Radical, extreme, lunatic Democrats are in charge. The things they are saying are unimaginable in our country. I love it. They are busy creating nonstop headlines that will give President Donald Trump and the GOP a victory in 2020. But don't take my word for it. Ask Rahm Emanuel, Barack Obama's former chief of staff and mayor of Chicago. He says the crazy, radical talk coming out of the Democrat Congress could lead to a shocking defeat. Or ask Howard Schultz, the former CEO of Starbucks and a lifelong Democrat, now mulling a presidential bid as an independent. He says Trump will win in 2020 if Democrats embrace "extreme socialism." Or ask Patrick Moore, the co-founder and former president of Greenpeace, who just reported Alexandria Ocasio-Cortez's Green New Deal would eliminate fuel for cooking, heating and transportation, thereby destroying our economy and causing mass starvation. He called her "a pompous little twit." Ocasio-Cortez said this past weekend that America is "10 percent better than garbage." She must be following Saul Alinsky's strategy. Alinsky advised, "Look in the mirror, and whatever you see, blame it on the other guy." Ocasio-Cortez must be a fan of socialist hellholes such as Cuba and Venezuela, where citizens are forced to eat out of dumpsters. Garbage must be on her mind. It's interesting to note that Ocasio-Cortez wants to eliminate air travel but she flew to her conference and then showed up at the event in a gas-guzzling SUV. Meanwhile, she is facing allegations that $1 million was diverted from her congressional campaign to a political action committee that she directed with her Silicon Valley campaign manager. Then there's Rep. Ilhan Omar. I just call her "the Jew-hater." She said only days ago that the difference between Obama and Trump is that "One is human." Omar is in the wrong place. It is no coincidence her wording is the exact same language used by Islamic extremists to describe Americans, Jews and Israel. They constantly call us "subhuman" and say we're therefore deserving of death. If Democrats had brains, they would expel Omar from Congress. Instead, they've put her on the powerful Foreign Affairs Committee, overseeing Israel. 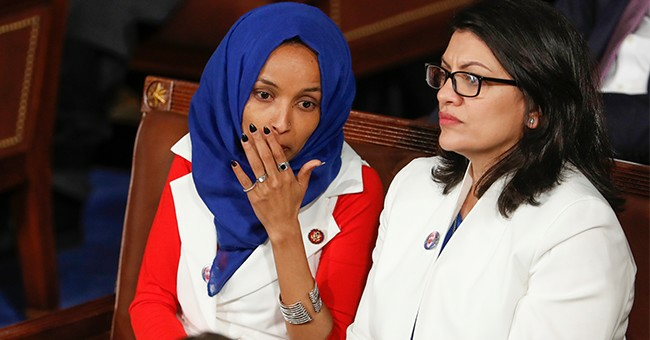 Omar's best comrade in D.C. is Rep. Rashida Tlaib. She appeared on stage days ago at a fundraiser for the Council on American-Islamic Relations, a group that Sen. Chuck Schumer once called "a front for Hamas." When Tlaib walked on stage, she screamed the Muslim war cry. On her Instagram account, she follows a "Free Palestine" group that compares Jews to vermin. Tlaib is the same congresswoman who on her first day in office screamed about President Trump on stage, "We're gonna impeach the motherf---er."